Risky Wars: Conquer the world! 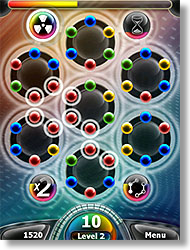 Spinballs is an exciting puzzle game with brilliant graphics, rocking music and great sound effects that introduces an unique gameplay. Seven discs with six coloured balls on each of them make up the playground. Each disc can be rotated clockwise or counterclockwise. Try to connect balls of the same colors by rotating those discs but never forget that time is running! The higher the levels the less time you have. Four helping elements can be charged and triggered to clear the field, slow down time, sort all balls or multiply the points owned. Use them wisely and develop your own strategy to reach the higher levels! Need more infos? Checkout the detailed gameplay section or take a look at the screenshots or the video in the media section. 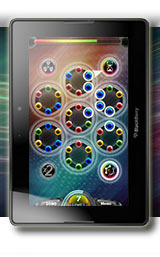 Even better: Download the latest demo version and make yourself a picture of Spinballs!